A guide for ACRM members working within special interest groups, networking groups and committees interested in developing products such as fact sheets and other products described below. The ACRM Communications Committee wants to help members develop products, and is charged to review and approve proposed product ideas. Before going too far in the process, fill out this brief form so we can give feedback on your idea. Fact Sheets provide summary information or resources, such as links to useful websites, devoted to a certain topic. Fact sheets are usually targeted to specific audiences such as people with disability, clinicians, researchers, or legislators. The ACRM has launched a new type of fact sheet, called Information/ Education Pages (IEPs). These will be printed as tear-out pages in Archives of Physical Medicine and Rehabilitation (Archives). They are intended to provide consumer-friendly information on topics relevant to rehabilitation, including basic background or overview (similar to a Wikipedia entry) or brief how-to suggestions. IEPs may be targeted either to people with disabilities/ caregivers, or to clinicians. If they are targeted to people directly affected by disability, the idea is that a clinical practitioner would tear out/ copy or print out the pages and make them available to patients and caregivers. In addition to publication in Archives and posting on the ACRM website, IEPs may be distributed more widely if they have commercial appeal. The creation of IEPs is a high priority for the ACRM and should be considered by any group wishing to create a relatively brief product that will be widely disseminated and is of immediate value to the organization. Practice parameters based on the evidence in a given area of rehabilitation. These are formal guidelines based on systematic reviews of the literature. Position papers or statements summarizing professional consensus. An excellent example of this is the ACRM definition of mild traumatic brain injury initiated by the BI-ISIG, which was first published in 1993 and subsequently translated into seven languages by the ACRM International Networking Group. Position papers may also be commentaries on rehabilitation-related topics with societal or public policy impact. 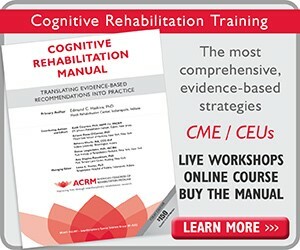 Manuals or kits developed for commercial distribution by ACRM, such as the Cognitive Rehabilitation Manual developed by the BI-ISIG. Special projects designed to facilitate research, such as recommendations to enhance uniform data collection for specific disability groups across multiple sites. 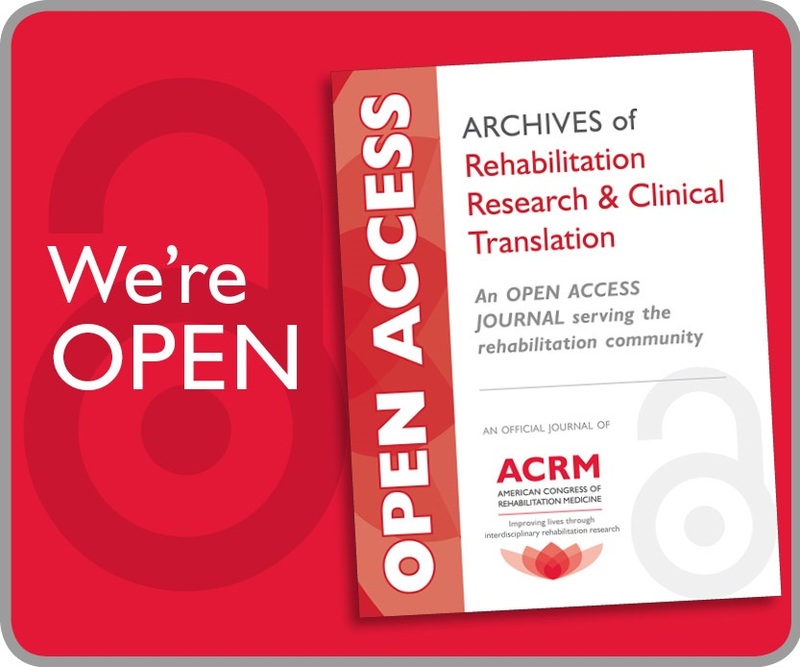 An example of such a project in which ACRM members are involved is the International Dataset for Spinal Cord Injury. These are just examples. 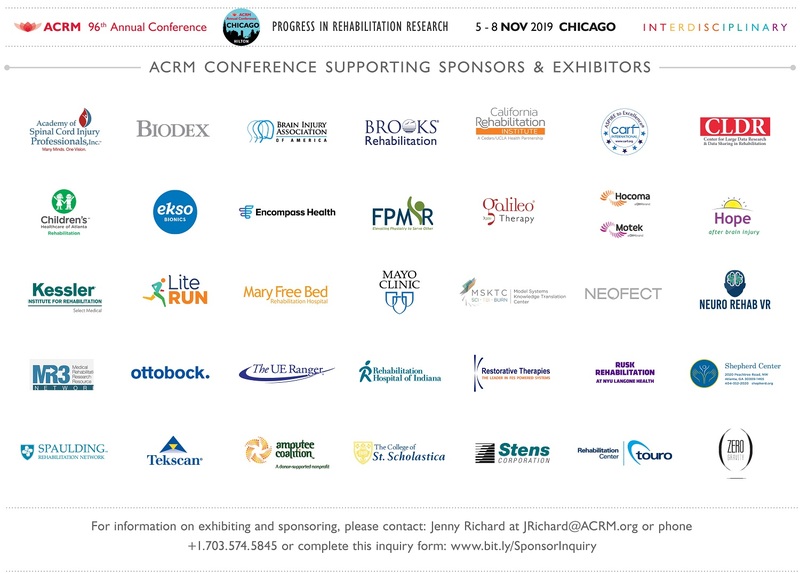 Anything of direct relevance to rehabilitation clinicians and researchers – even a device – that is developed by a Committee, ISIG, Task Force, or other organized group within the ACRM, and that can be disseminated both inside and outside of the ACRM, might be considered a product. 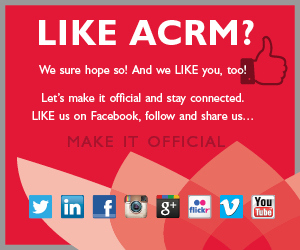 CAN PEOPLE FROM OTHER ORGANIZATIONS PARTICIPATE IN PRODUCING ACRM PRODUCTS? Yes! In fact, some of the examples listed above could not happen at all without multi-organization collaboration. The ACRM is very interested in sharing resources and ideas to develop products that will be more widely disseminated as a result of the collaboration. Good products will be a credit to everyone involved. Issues such as joint ownership and use of copyrighted materials will be examined on a case-by-case basis. CAN PREVIOUSLY DEVELOPED MATERIAL BE INCLUDED IN A PRODUCT? Yes. Material that has been published in print or on the Web could be included in a product if appropriate. If a copyright to the material is held by someone else, permission to use it would need to be secured by the authors before ACRM could publish it (e.g., in the Archives or on the ACRM website). The Communications Committee can provide guidance on how to do this. WHO DISTRIBUTES THE PRODUCT AFTER IT’S DONE? It depends on the type of product. Some are distributed along with Archives, such as systematic reviews and Information/ Education Pages. In the case of IEPs, they are printed as tear sheets to encourage recipients of Archives to reproduce them further and distribute to consumers or clinicians as they see fit. The authors of IEPs may also distribute their own sheets as they wish, even though copyright to the material is ceded to ACRM on publication (as for journal articles). As long as copies are made without modification of the material and are not used for financial gain, wide distribution is a “win” for everyone involved. Lend visibility to the organization. Products raise the visibility of ACRM and its committees, ISIGs, networking groups, and task forces, benefiting all members. Foster collaboration. Products can be a great vehicle to network and collaborate with people who have common interests. Guide the activity of a task force. A product can help task force members to focus on plans that lead to tangible achievements. Develop expertise. Creating a product allows developers to learn a lot about something they’re already interested in. Product developers can become the “go-to” people in a certain area by creating a product about it. Help advance rehabilitation. Products help advance the field of rehabilitation via new information and resources. Fame and fortune – or at least the fame part. A good product that gains notoriety brings name recognition to its developers. Some products can be listed on CVs and contribute to career advancement. Yes and no. It’s important to note that groups within ACRM are always free to work on anything they choose – products or other projects – without the need for clearance or oversight from the ACRM. The ACRM sees its internal groups as essential to promoting collaboration and free exchange of ideas, and does not impose control over these groups’ specific activities. However, if you and your work group want ACRM to brand your product with its logo, place the product on the ACRM website, publish it in Archives, and/ or help to disseminate it in any other way, then you must follow the approval process below. The purpose of this process is to ensure that official ACRM products meet high standards of quality, that they do not duplicate existing materials, and that they will have a reasonably consistent “look and feel” that identify them as belonging to ACRM. WHAT IS THE APPROVAL PROCESS FOR ACRM-BRANDED PRODUCTS? The process is a bit different depending on the type of product and the target audience. If you are planning an evidence-based product targeted to a professional audience, such as a systematic review of the literature that results in the creation of practice parameters or a position statement based on a synthesis of expert opinion, you should consult with the Clinical Practice Committee by emailing the chair, Ron Seel. This committee can help you formulate a specialized work plan for this type of product. If you’re not sure which committee to consult, just email Ron Seel and/ or the Communications Committee chair, John Morris. These committees work closely together and can decide which members are best to help with or review which products. For other products such as fact sheets or IEPs, your product will be reviewed by the ACRM Communications Committee. For these products, follow the steps below. Step 1. Plan ahead. We urge you to plan carefully so that your product will be readily approved. Your planning group may find the Product Development Worksheet helpful. Working though this list will help ensure that your work group is thinking about the same things the committee will be considering when they review your product. Step 2. Work on your product. Need help? The Communications Committee can assist you or find someone who can. Email them through the chair, John Morris. Step 3. Send your product to the Communications Committee for official ACRM review. To do this, you must complete the Product Review Request Form and send it as an email attachment to John Morris. You must copy your task force/ ISIG chair(s) on this email to ensure that they know the product has been submitted. Step 4. The Communications Committee will review your product, arrange for external review as needed, and/ or involve another committee with appropriate expertise. The committee will send comments or requested changes directly to you within 30 days, and will also review revisions of your product if needed. Once your product is approved…. Step 5. Branding and dissemination. Congratulations! Your product is almost ready for the outside world. At this stage the ACRM logo will be added, plus credits for the work group and the leader(s) of this specific project. The ACRM will promote products in ways that fit for each one, depending also on the resources available. For example, Information/ Education Pages may be posted on the website in addition to being published in Archives. We welcome your comments about this Guide to Products. Please send questions or suggestions to the Communications Committee, c/o John Morris. 1Cicerone KD, Dahlberg C, Kalmar K, Langenbahn DM, Malec J, Bergquist TF, et al. (2000). Evidence-based cognitive rehabilitation: recommendations for clinical practice. Archives of Physical Medicine and Rehabilitation, 81, 1596-1615. 2Cicerone KD, Dahlberg C, Malec, JF, Langenbahn DM, Felicetti T, Kneipp S, et al. (2005). Evidence-based cognitive rehabilitation: Updated review of the literature from 1998 through 2002. Archives of Physical Medicine and Rehabilitation, 86(8), 1681-1692. 3Cicerone KD, Langenbahn DM, Braden C, Malec J, Kalmar K, Fraas M, et al. (2011). Evidence-based cognitive rehabilitation: Updated review of the literature from 2003 through 2008. Archives of Physical Medicine and Rehabilitation, 92(4), 519-530.